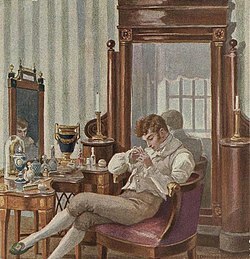 The character type originates in Alexander Pushkin's verse-novel Eugene Onegin (1825–32). This term was popularized by Ivan Turgenev's novella The Diary of a Superfluous Man (1850) and was thereafter applied to characters from earlier novels. Mikhail Lermontov's A Hero of Our Time (1840) depicts another Superfluous Man – Pechorin – as its protagonist. He can be seen as a nihilist and fatalist. Later examples include Alexander Herzen's Beltov in Who is to Blame? (1845–46), Ivan Turgenev's Rudin (1856), and the title character of Ivan Goncharov's Oblomov (1859). Russian critics such as Vissarion Belinsky viewed the superfluous man as a byproduct of Nicholas I's reign, when the best educated men would not enter the discredited government service and, lacking other options for self-realization, doomed themselves to live out their life in passivity. Scholar David Patterson describes the superfluous man as "not just...another literary type but...a paradigm of a person who has lost a point, a place, a presence in life" before concluding that "the superfluous man is a homeless man". The superfluous man is often in contrast politically with the great man. Chances, Ellen (2001). "The Superfluous Man in Russian Literature". In Cornwell, Neil (ed.). The Routledge Companion to Russian Literature. New York: Routledge. ISBN 978-0-415-23366-8. Patterson, David (1995). Exile: The Sense of Alienation in Modern Russian Letters. Lexington: University Press of Kentucky. ISBN 0-8131-1888-3. This page was last edited on 23 November 2018, at 01:42 (UTC).